I always loved the first day of school! So much to look forward to. Showing up with Starbucks or Dunkin' Donuts would totally trump ye ole traditional apple wouldn't it? That's why I surprise Princess's day care teachers with DD gift cards every now and then. They love it and deserve it. Remember to post a "precious moment"! Have a great one! And maybe TWO lattes! Hope its a great first day! I hope your first day went well! Oh, and I wish someone brought me a latte on my first day. ;) However, I will say that last year, we got a plethora of Starbucks cards for Christmas, which was SWEET. HAHAHAHAHHA! I bet that does sum it up. 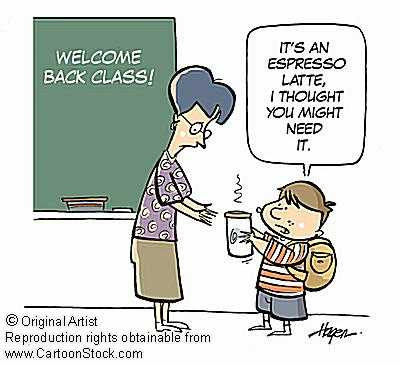 That would be great if students brought you coffee every day! Welcome back! Hope you had a great day! Oh, that is perfect! LOL! I love starbucks gift cards... hope you had a good 2 days with the kids. Our kids start monday. I have spent the past 3 days in meetings and what seems like very little time in my room. I think I'm ready tho! A double shot of something on Monday sounds good!